"Little Bo Peep has lost her sheep and doesn't know where to find them. Leave them alone and they'll come home. And bring their tails behind them." And said, what a good boy and I"
This would have been quite an expensive gift to buy new for a child and the quality stands out even today. 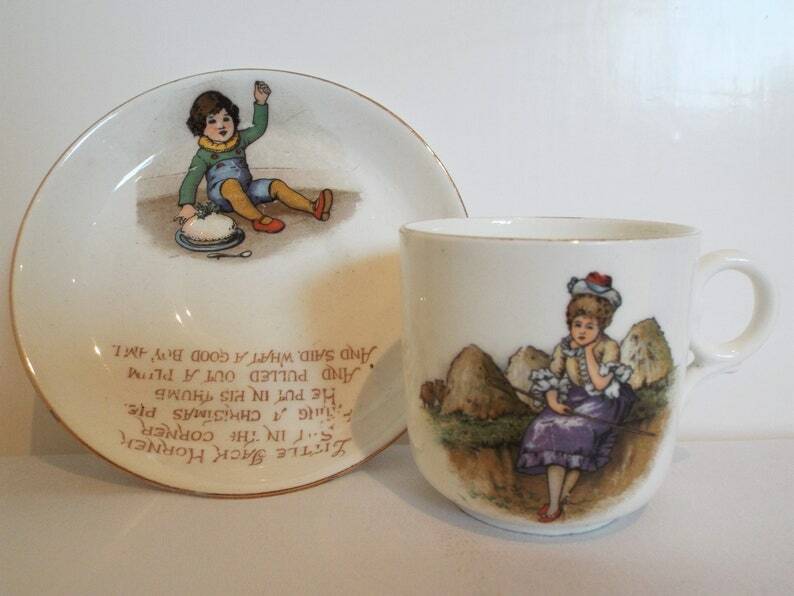 The Tuscan mark is stamped under each piece of this teacup and saucer and the pattern number 'Rd No 657 007' is stamped on the underside of both the teacup and saucer. It would make a wonderful gift for a child today, perhaps for a Christening or birthday. Or just keep it for yourself and enjoy its charm! Whilst intended originally for a child, it is still a good size and not at all tiny - see dimensions below. In good vintage condition, crack and crazing free. There is wear to the gilding in some areas around the rim edges and on the handles, but this is commensurate with age and use. The images vibrant colours is in very good condition, with a little minor wear to the Jack Horner nursery rhyme, but nothing that spoils this set. There are some tiny and very pale pin prick flecks in the china in places, which are simply a result of the manufacturing process of the time and reflect the age and history of the set. They do not spoil it at all. There is one tiny hairline crack towards the base of the teacup, which can be seen in photo 10. This barely goes through the entire depth of the china to the inside of the cup and is very very hard to spot. It does not affect the soundness or usability of this teacup. It is to be expected given this piece was intended for a child, and so few of them survive. Any further wear or marks are commensurate with age and reflect the tea party heritage of this most charming teacup and saucer. Due to the value of this teacup, it will only be shipping 'tracked and signed' to international addresses, or first class 'signed for' to UK addresses. Includes FREE pretty gift wrapping.